I finally finished a project that was started last July. Yeah, I know that's over six months ago...but well, I'm not even going to start with the reasons for the tardiness of this project because it's not really all that exciting! But when Hannah finally let me paint her hand after being freaked out by Greg's paint covered hand three months ago I was finished! Yup, Hannah wanted nothing to do with the project so I had to put it on the back burner for a while and wait her out. This project was started as a gift for my parents 40th Wedding Anniversary which was in June. We all (my sister, her hubby, my brother, his wife and two girls, my family and my parents) gathered together at a time share in Illinois for a week of fun last July! I don't think I ever posted about that vacation. I'm not only 6 months behind on projects but also 6 months behind on blog posts it seems. Oh well, life goes on. 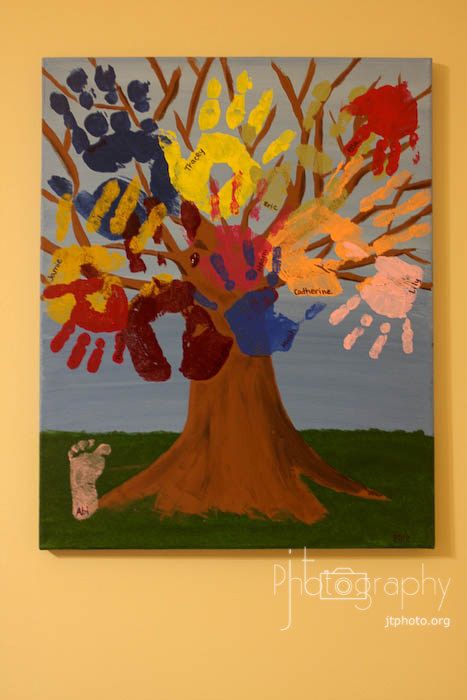 While we were all together I wanted everyone to put their hand prints on the "family tree"...but I didn't have the tree finished when we got to our vacation destination. The background was painted and the tree was started but nothing was really done. I knew that if I didn't have people put their hand prints on the canvas it would be well over a year before I finished this project...so I had them put their hand prints on and finished the tree at home at a later date. 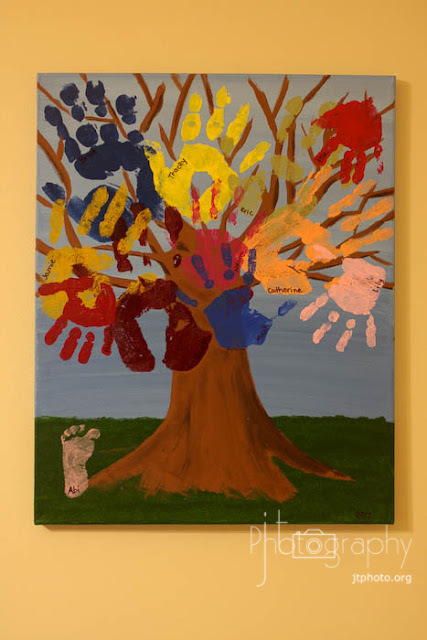 Once I got the tree finished then my family added our hand prints but Hannah wanted NOTHING to do with it. 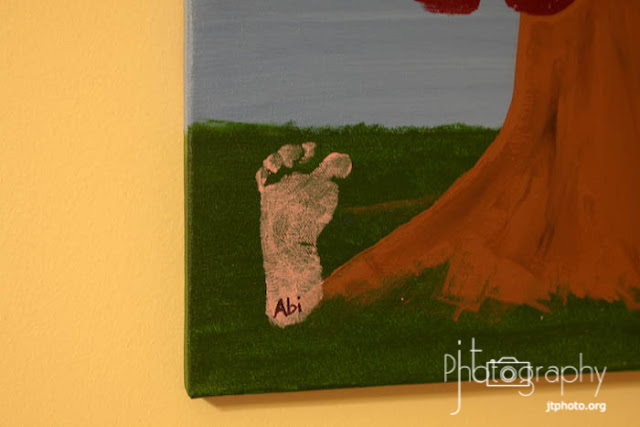 So this past week when we were painting feet and fingers for some Valentine's Day crafts I convinced Hannah to let me paint her hand, and she let me. And the project was then completed. I then told my mom I had a surprise for her and took the canvas to my parents house. 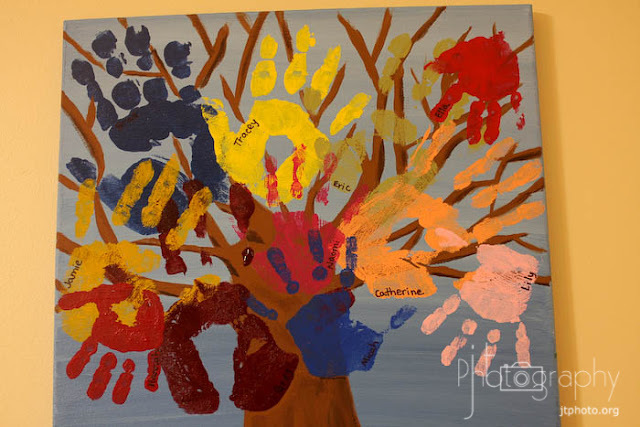 She really was surprised she said she had forgotten all about the family tree. See, sometimes it's helpful to have a bad memory and to make projects drag out over 6 months...it makes the project new and exciting. My dad had just finished painting their entryway red so this was hung up right there in the newly painted entry way. It looks great on that wall. These photos below are of the painting in my house before I took it over. 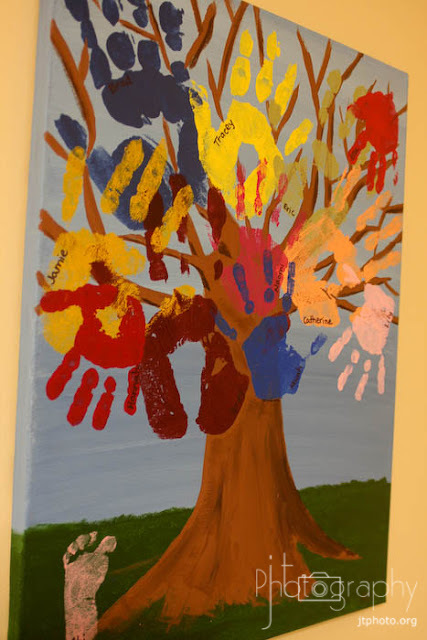 The kids were so excited to see their hand prints again when I got this out to add Hannah's hand. 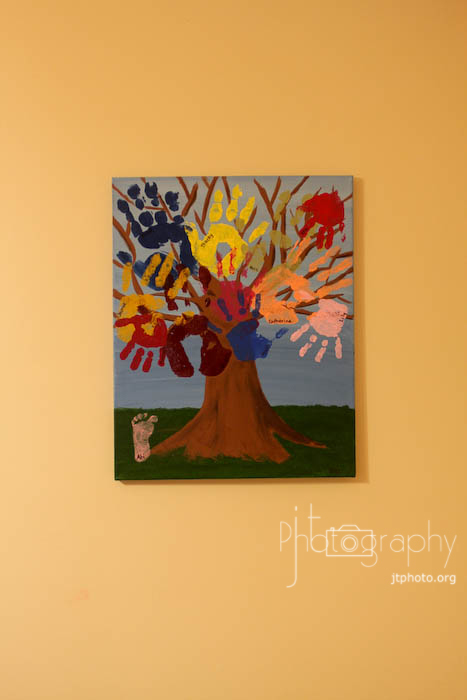 While most of our hands won't change too much it's fun to have them all there together hanging out on the family tree!